The Los Angeles Dodgers lineup is littered with stars, headlined by Cuban sensation Yasiel Puig, followed by the likes of Matt Kemp, Adrian Gonzalez, Hanley Ramirez, Carl Crawford and Andre Ethier. At one time, or another, these guys have carried the load for their team at the big league level. 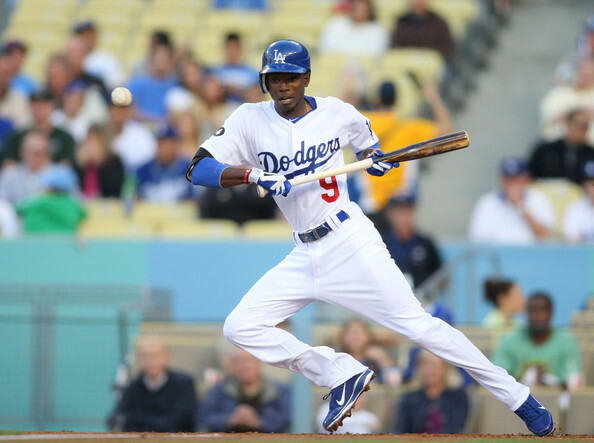 The Dodgers also have Dee Gordon, the son of former MLB pitcher Tom “Flash” Gordon, who presents a skill-set that separates him from the stars he follows. The Dodgers lone question mark headed into this season was who would be the starting second baseman? That question is no longer relevant. Gordon is the starting second baseman and it appears he’s not giving it up anytime soon. Granted, we’re only 13 games into the 2014 season but Gordon has become a prized asset in this lineup of high-profile names. Gonzalez hit a home run on Sunday for the fourth consecutive game, while Gordon became the sixth Dodger in franchise history to swipe four bases in a single game. (Last Dodger with four stolen bases in a single game was Rafael Furcal; 2007). Gordon was wreaking havoc on the base paths, at one point stealing second, and then he stole third a couple of pitches later without a throw. His speed has never been put into question, though. The struggle of hitting major league pitching has held him back from utilizing his legs. Nonetheless, through the first two weeks of the new season, Gordon is looking like a legit big league hitter. He’s keeping the ball out of the air, working counts, drawing walks (4) and spraying the ball all over the diamond (16 hits). His .400/.457/.525 split is impressive from what we’ve ever previously seen from him, and goes along with his MLB leading nine stolen bases. Manager Don Mattingly has plugged Gordon into the eighth or leadoff spot in his lineup and looks like a genius thus far. The 2014 Dodgers lineup would also make for a superb package of Topps baseball cards. However while Gordon would likely be the least valued out of that package, that hasn’t been the case on the diamond these days. The Dodgers need Gordon in the lineup, day in and day out. This could be an overreaction to his hot start, or not, but either way Gordon’s talent will be a key to the Dodgers success this season. It was opening night in San Diego on Sunday, where the San Diego Padres and Los Angeles Dodgers kicked off the MLB season at Petco Park. Clayton Kershaw didn’t pitch for the Dodgers (15-day DL), so another southpaw, Hyun-Jin Ryu got the nod for Los Angeles. Those would be some big shoes to fill for the young Korean, but Ryu did his part. Ryu struggled early with his command, eventually getting himself into and out of a first inning bases loaded jam with a 1-2-3 double play. Then he became Korean Kershaw. He ended up throwing seven scoreless innings with seven strikeouts, and at one point retired 16 consecutive hitters. Ryu would leave the game with a 1-0 lead, the lone run coming from a Carl Crawford RBI-single in the fifth inning. Dodgers’ manager, Don Mattingly, went with Brian Wilson to begin the top of the eighth inning. Three pitches later and the game was tied; 1-1. Wilson left a pitch over the plate, and Padres pinch-hitter Seth Smith launched it over the right field wall. The eighth inning would only get worse after that. Wilson walked Yasmani Grandal, and then badly misplayed Everth Cabrera’s sacrifice bunt. With runners on second and third with no outs, Padres Chris Denorfia bunted through Wilson’s pitch, Juan Uribe was charging in hard from third base and couldn’t recover before Grandal stole the empty base without a throw. The Dodgers allowed Cabrera to steal second shortly after and then Denforia’s dagger of a two-run single gave San Diego the 3-1 lead. Wilson never recorded an out, Chris Perez got one before Paco Rodriguez came in and struck out the rest. 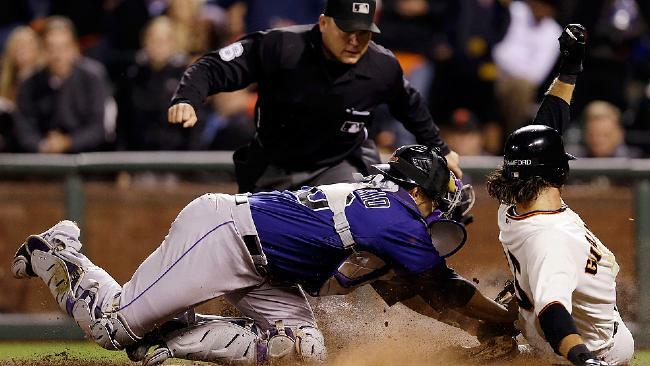 Houston Street, the Padres closer put the Dodgers to bed in the top-half of the ninth inning. The Dodgers left six runners on base Sunday night but left Ryu without any reward for his stellar performance in place of the two-time CY Young Award winner. It’s a loss that will linger for a bit, or at least for a day, until the Dodgers play San Diego again on Tuesday. The Los Angeles Dodgers announced that they’re going with the four-man rotation in the National League Division Series, against the Atlanta Braves. “Pitching wins in the postseason,” is a phrase that you’ll frequently hear every October, which has been true for the most part. The four-man rotation of Clayton Kershaw, Zack Greinke, Hyun-Jin Ryu and Ricky Nolasco is arguably the best of the bunch headed into the 2013 postseason. Any rotation featuring Kershaw and Greinke would be tough to beat in any series. The Dodgers don’t plan on using a three-man rotation, even if they were to go down 2-1 in this best of five series. Nolasco ended the regular season on a horrendous note, after going 5-0 with a 1.64 ERA in August. In the month of September, he finished with a 2-2 record and 6.66 ERA. It’s unclear which Nolasco will show up in the postseason and the Dodgers can’t afford to find that out the hard way. Kershaw has never pitched on three days’ rest in his career, but that’s true for all pitchers until they end up doing it. The Dodgers 25-year-old southpaw is invaluable and is arguably the best pitcher on the planet. Kershaw just captured his third consecutive ERA title (1.83), punched out 200-plus batters for the fourth consecutive season, and is the favorite to win his second CY Young Award in three years. You can’t convince anyone that any other pitcher belongs on the mound in an elimination game. (Kanye West is even capable of making the right decision on this one). The three-man rotation should also be considered in Game 4 even if the Dodgers hold a 2-1 series lead over Atlanta. The Braves finished the 2013 regular season with the best home record in all of baseball; 56-25. So, Los Angeles should want to avoid going back to Atlanta for a decisive Game 5 of the series. 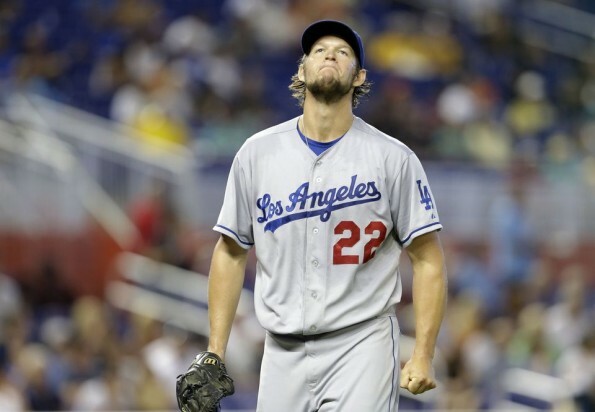 Throwing Kershaw on three days’ rest makes sense here, too. A win would avoid the long trip from Los Angeles to Atlanta to play that elimination game and would save Greinke for Game 1 of the next series. A loss would still have Greinke pitching in that elimination game in Atlanta, but would push both aces back in the championship series. The postseason isn’t guaranteed every year, just ask the Washington Nationals. The Dodgers have two of the top pitchers in baseball and shouldn’t hesitate to use them. Pitching on three days’ rest was never a topic of discussion decades ago, it was just expected. Nowadays, it’s a rare feat. However, it’s still done when winning is the priority; Curt Schilling did it twice during the Arizona Diamondbacks 2001 World Series; Josh Beckett did it during the 2003 Florida Marlins World Series; and CC Sabathia hasn’t been afraid to take the ball when needed over the last couple of years. If the Dodgers stick with the four-man rotation in this series, so be it, but Kershaw and Greinke are there for a reason. The Los Angeles Dodgers are arguably the best team in all of baseball, at least for the moment. That’s something you couldn’t dare to say during the first half of the season, though. 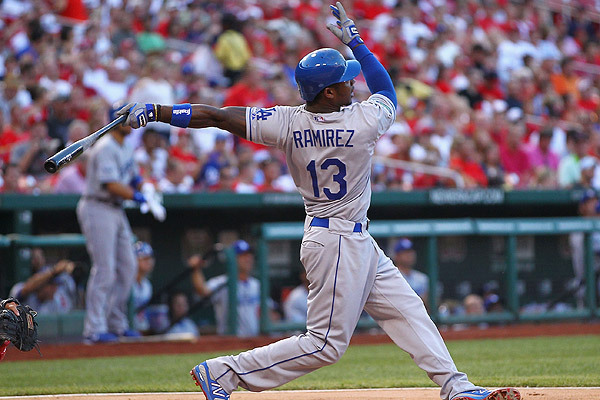 Rookie sensation Yasiel Puig has accumulated most attention from around the league, which is warranted, but the recent success of the Dodgers has been triggered by the emergence of Hanley Ramirez. It was a season that began on the disabled list and seemed as if that’s where most of his time was being spent in 2013. Things have clearly changed. On June 4th, Ramirez returned from his second stint on the DL. Since then, his .384 batting average is an MLB best. On July 11th for the first time since April 15th the Dodgers had finally climbed above the .500 mark and haven’t looked back. 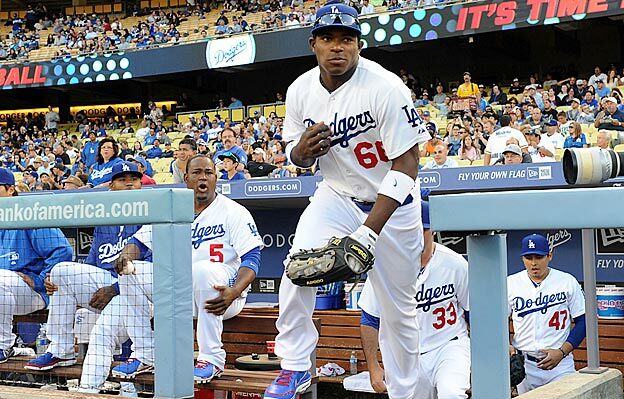 There’s not a doubt that Puig jump-started this engine, but Ramirez is the one keeping it on track. The Manny Ramirez-esque easygoing attitude of Hanley has the Dodgers playing without a sense of urgency that you saw during most of the first half of the season. In 2008, Manny put up some gaudy numbers to carry the team all the way to the NLCS. This current run by Hanley has a similar feel to it, when something big always seems to happen when he’s up at the plate. Teams are slowly starting to treat him like they treated Manny back in 2008, which means avoid pitching to him when the opportunity presents itself. He’s hitting anything and everything right now, with most of his hits getting hit harder and harder every single time. Since June 19th, Ramirez is hitting .431 (1st in MLB), with 27 RBIs (2nd in MLB) and has a .798 slugging percentage (1st in MLB). The Dodgers have gone 21-8 during that stretch and trail the Arizona Diamondbacks by just 0.5 games in the National League West division. All of this attention placed on Puig has probably created this monster in Ramirez, who has spent most of his career in the spotlight. The pressure to carry the load is off his back and now a few bad games doesn’t collect most of the blame as it would have in his days with the Miami Marlins. Credit for a win or blame for a loss in Los Angeles these days has strictly been directed towards Puig, which has allowed Ramirez to have a carefree approach this season. The best hitter arguably in baseball right now hasn’t been talked about nearly as much as he should, but that’s been the secret all along. So the national media can continue to keep a close eye on the rise of Cuban phenom Yasiel Puig, while Hanley Ramirez and the Dodgers stealthily make their way to the top of the NL West division. The Los Angeles Dodgers had been long awaiting the arrival of one super-prospect, 22-year-old Cuban defector Yasiel Puig. The organization finally had no other choice but to call up Puig on Monday night against the San Diego Padres, with most of the team on the disabled list these days. Whether this move should’ve happened sooner or not, the wait to see the phenom outfielder in a Dodger uniform was finally over. Puig delivered a major league debut that’ll be talked about for years down the road, and it wasn’t because of his bat as most people would’ve expected, after he hit over .500 in spring training for the Dodgers. Despite going for 2-4 with two singles in his debut, the big right arm of Puig’s was getting all the attention after Monday night’s game. The Dodgers had a 2-1 lead over the Padres in the top of the ninth inning, and then the “Cuban missile” known as Puig’s right arm happened. 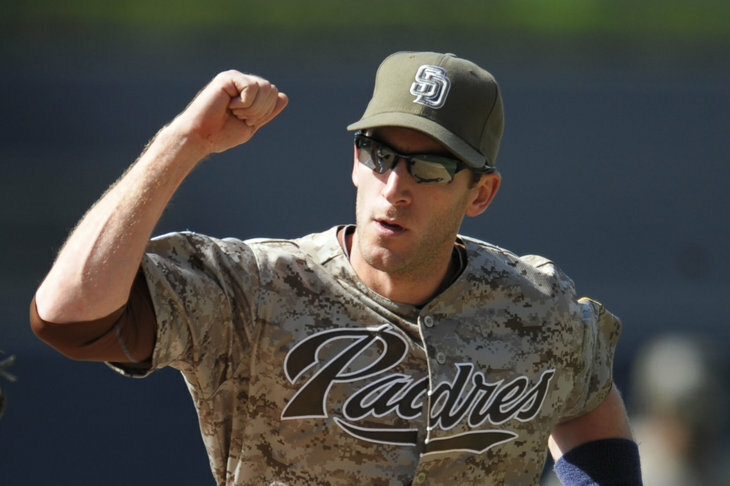 He gathered himself underneath a fly ball at the warning track to make out number two with a runner on first, after making the catch at the track he fired an absolute perfect strike to first and doubled up Padres outfielder Chris Denorfia, ballgame. (This walk-off double play was way cooler than most walk-off home runs I’ve seen this season). What would Puig do for an encore on Tuesday night? He only went 3-4 with two home runs, five RBIs, two runs, while leading the Dodgers to a 9-7 win over the Padres. The Dodgers have found the answer they’ve been looking for, and the National League West is still in definite striking distance with plenty of baseball left to play. Last season, remember when the “Anaheim” Angels started 6-14 and then called up the eventual 2012 AL Rookie of the Year Mike Trout? Everything instantly turned around for the Angels. Trout’s impact alone lifted the Angels back into playoff contention for the rest of the season, only to come up short in the competitive American League West. It’s not a stretch to say Puig could have that same impact on this Dodgers team, bringing almost the same dynamic style of play to the diamond as Trout. He probably won’t have the year Trout had last season, but that’s tough for anyone to accomplish. However, not one team is running away with the NL West anytime soon, so Puig’s impact could put the Dodgers right back into the division race in just a couple of weeks. Puig and company look like they’ll be able to hold down the fort until Matt Kemp, Carl Crawford, and AJ Ellis return from the DL, which would give the Dodgers time to discuss possibly trading Andre Ethier to make Puig the everyday right fielder in Los Angeles. Manager Don Mattingly has found the missing piece to the puzzle in Puig, and once the rest of his players get healthy he’ll finally get to piece this whole thing together. The Dodgers might have called up Puig just in time and his impact could take this team in the direction they’ve been destined for all season. Rumors have surfaced over the past week about Don Mattingly’s job security as the Los Angeles Dodgers manager, with the boys in blue currently 7.0 games back in the National League West and in last place almost two months into the season. New ownership and its $200 million payroll that features a star-studded lineup put “World Series or Bust” type expectations on this ball club from the start. Injuries, poor execution and just flat-out bad baseball have gotten the Dodgers to this point of desperation. Mattingly showed a sense of urgency before Wednesday’s game against the Milwaukee Brewers, with a rare lineup change. It’s nothing new to see Andre Ethier get an occasional day off with a left-hander on the mound, but Ethier wasn’t penciled into Wednesday’s lineup with a right-hander on the hill for Milwaukee. Initial thoughts were that maybe Ethier was being bothered by some sort of injury, however, that wasn’t the case. Mattingly didn’t hold back anything about his decision to sit Ethier when meeting with reporters during pregame. “I’m putting out my lineup that I feel is going to be most competitive and going to compete the hardest” Mattingly said. That’s about as clear as a message as you’re going to get from a manager. 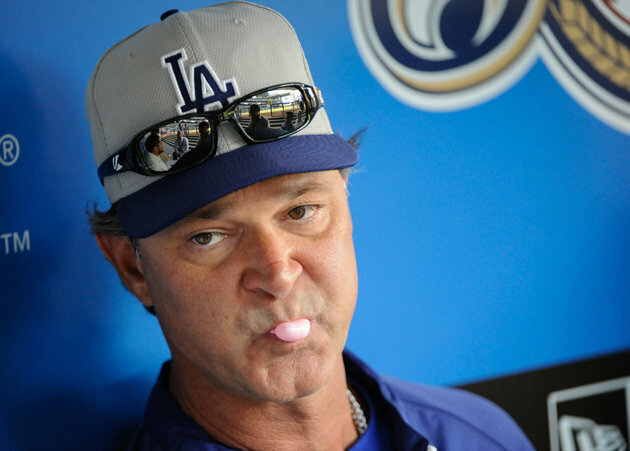 The recent rumors about Mattingly have clearly been taken personal. He knows that his job isn’t safe if the losing continues, so if he feels someone isn’t giving it a 100 percent than all power to him for putting his foot down. Ethier is hitting just .264 with four home runs and 15 RBIs this season. He isn’t the only Dodger struggling, though. Matt Kemp is hitting .265 with two home runs and 16 RBIs, but Mattingly obviously doesn’t see any issue with his effort. The job of a manager is to get the best out of his players and this message was an indication that he wasn’t getting that. This could be just another managerial tactic that we’ve seen before, where a player gets a wakeup call from his manager, but who knows. What we do know is that if Mattingly ends up losing his job he’ll make sure that his players on the field are fighting for him till the very last out.